Genome-wide association analysis is a powerful approach to identify the causal genetic polymorphisms underlying complex traits. In this study, we evaluated a population of 191 soybean landraces in five environments to detect molecular markers associated with soybean yield and its components using 1,536 single-nucleotide polymorphisms (SNPs) and 209 haplotypes. The analysis revealed that abundant phenotypic and genetic diversity existed in the studied population. This soybean population could be divided into two subpopulations and no or weak relatedness was detected between pair-wise landraces. The level of intra-chromosomal linkage disequilibrium was about 500 kb. Genome-wide association analysis based on the unified mixed model identified 19 SNPs and 5 haplotypes associated with soybean yield and yield components in three or more environments. Nine markers were found co-associated with two or more traits. Many markers were located in or close to previously reported quantitative trait loci mapped by linkage analysis. 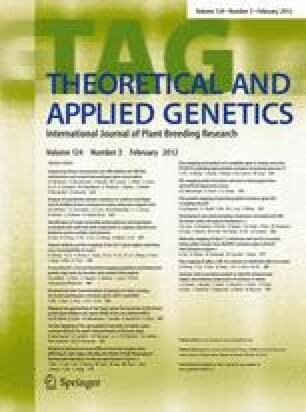 The SNPs and haplotypes identified in this study will help to further understand the genetic basis of soybean yield and its components, and may facilitate future high-yield breeding by marker-assisted selection in soybean. The online version of this article (doi: 10.1007/s00122-011-1719-0) contains supplementary material, which is available to authorized users. This work was supported by the National Basic Research Program of China (973 Program) (2010CB125906, 2009CB118400) and the National Natural Science Foundation of China (30800692, 31000718). Two anonymous reviewers are thanked for their highly valuable and very helpful comments.